Palestinian Authority President Mahmoud Abbas has won the approval of the United Nations General Assembly for ‘Palestine’ as a nonmember state, a dramatic move that may have wide-reaching implications. Though Israel and the US vociferously opposed the move, it passed by a wide margin. The Times of Israel liveblogged developments from Jerusalem and New York. Read how the events unfolded here. Preamble: November 29, 1947, saw the United Nations vote to split Mandatory Palestine into two states, one Jewish and one Arab. Sixty-five years later to the day, the Palestinians are turning to the world body and asking the international community to grant them nonmember status, a move that will give them recognition worldwide as a member of the community of nations. Israel has vociferously opposed the statehood move, which it says will bypass peace talks and make conditions for a two-state solution more difficult. But after years of stalled talks, Ramallah says going to the UN for statehood is a last-ditch measure made to force Israel to negotiate based on the 1967 lines. The General Assembly is expected to convene at 3 p.m. New York time (10 p.m. in Israel) to discuss and then vote on the resolution. After opening words from UN chief Ban Ki-moon, Palestinian Authority President Mahmoud Abbas and Israeli UN ambassador Ron Prosor will both speak. The vote is expected to take place at around 5 p.m. and Palestinians say they believe at least 130 countries will vote in favor of statehood. On Thursday, Prime Minister Benjamin Netanyahu said the bid would delay Palestinian self-determination. “The UN resolution will not change anything on the ground… It won’t bring a Palestinian state closer to existence, but push it further away,” he said. Writing in the Wall Street Journal, Prosor said the Palestinians were not ready for statehood. That likely previewed the content of his speech. “The foundations for real Palestinian statehood and real peace can only be laid through hard work on the ground and direct talks with Israel,” he wrote. The US, which is expected to be one of a handful of countries to abstain or vote no, has stepped up efforts aimed at pulling Abbas back. On Wednesday, senior state department official William Burns met with Abbas and pleaded with him to withdraw the resolution, according to reports. Abbas said it was too late. Yet some in Jerusalem, most notably former prime minister Ehud Olmert, have come out in support of the move, saying that moderates like Abbas need to be strengthened in the face of challenges from Hamas. Others point to several statements by Abbas, such as the one delivered earlier this month to the Arab League, that seemed to suggest a willingness to return to negotiations in the wake of the UN vote. “If it is possible to start talks on the following day [after the UN vote] then we are ready for that,” Abbas told reporters in Cairo. The granting of statehood is likely to have a number of wide-reaching implications. The Palestinians may gain access to a number of world bodies, including the International Criminal Court, which it can use to prosecute Israel for war crimes. For its part, Israel has threatened to impose a number of punitive measures on the PA, like collecting on a NIS 700 million debt owed the Israel Electric Corporation. That would strain ties. Congress may also look to penalize the Palestinians or the United Nations. Meir Indor, the CEO of the Almagor Terror Victims Association says EU countries’ support of the Palestinian UN bid represents a victory for terror. Indor, who describes himself as a second-generation Holocaust survivor, says European countries should have learned from the past. “Those countries that collaborated with the slaughter of Jews in Europe, should have at least stood to the side, if not expressed solidarity with us Jews who suffered from the terrorist acts of the Palestinian leaders who are being recognized today,” he says. Noam Shalit, father of kidnapped soldier Gilad Shalit, is asking the members of the Labor party to support his bid for a spot on the party’s Knesset list because he gained experience in a public struggle and can now “replace the bad government.” He was referring to the same government that freed his son in exchange for more than 1,000 terrorists. In a letter by Shalit that has been circulated among Labor members in recent weeks, Shalit noted that he has been a member of the Labor party for many years, and has become an active member since the 1995 assassination of Prime Minister Yitzchak Rabin. Shalit wrote in the letter that he was exposed to the power of the political system during his five-year struggle to bring about his son’s freedom. Shalit announced in January that he intends to run for a spot on the Labor party’s Knesset list, and was accused of being ungrateful towards the Likud-led government that worked to free his son. In February, Shalit was verbally attacked by activists who spoke out against the deal Israel signed with Hamas to free Gilad. 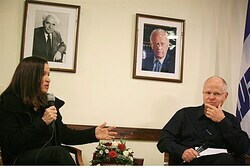 The confrontation took place during a panel at the 9th Jerusalem Conference, sponsored by the Besheva magazine. Meir Indor, who heads the Almagor Terror Victims’ Organization and was one of those who criticized Shalit, later explained to Arutz Sheva why he chose to attack Shalit at the panel. “We gave them a lot of respect so long as his son was in Hamas’ hands, but once he decided to go into politics and he’s carrying the flag of releasing terrorists, we decided to stop giving respect and tell Israeli society that this man, in our eyes, serves Hamas’ agenda,” said Indor. Fifteen terrorists released in the Shalit deal have since been rearrested, a senior IDF source in the Judea and Samaria Division said last month. In September, after a terrorist who was freed in the deal was arrested for further terror-related crimes, MK Danny Danon (Likud) called on security forces to re-arrest the freed terrorists.